The feature-length documentary Blood and Oil ? 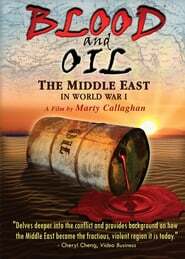 The Middle East in World War I exposes the Western greed and political intrigue which laid the foundation for wars, coups, revolts, oppressive dictators and military interventions in today?s Middle East. Palestine, Lebanon, Syria, Jordan, Iraq, modern Turkey and other hot spots are born as the British and French divide the ?fruits of victory? in World War.